On certain Saturdays, my wife works an overnight shift. That means the girls and I strike out on our own to give Mom a quiet house during the day. These Saturdays turn into mini adventures for me and my two inquisitive, precocious little girls; Evelyn (7) and Audrey (4). Our adventures require full on parenting — navigating the emotional rollercoaster of playground dynamics, negotiating how much ice cream they can earn by helping Dad, and debating the exact minutes of screen time allotted. But they are also precious days spent in father-daughter bonding. So, when Jennifer Vieth, Executive Director of the Carpenter Nature Center, invited me to their raptor release, I was all in. After all, I thought causally, it sounded like a great way to kill some time. As we ascended St. Croix Trail, I knew immediately that this was a special place. We drove only a little over 30 minutes from our familiar sidewalks and storefronts in South Minneapolis. Once atop the river valley we found an elegant vista, where lush green fields roll down to the St. Croix River’s shoreline and soaring oaks and maples stretch over the tidy, stone buildings. The aesthetics of Carpenter Nature Center welcome visitors immediately and, along with incredibly friendly staff and volunteers, invite them to learn and explore. The interpretive center heldmyriad natural treasures; animals, birds and reptiles that we could meet and even adopt in our bid to be closer to nature. Then, of course,there was the main event. 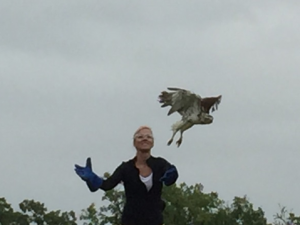 The raptor release (in partnership with the University of Minnesota Raptor Center) was truly inspiring. A couple hundred people descended on a gentle slope to encourage these majestic birds as they spread their wings and leapt into the sky for the first time since suffering injuries. 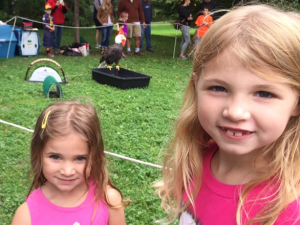 My girls saw them up close, watched them fly, heard their wings beat the air and saw them perch in a treetop for one last grateful look at their rescuers. Evelyn, long obsessed with owls, bubbled over with questions and scarcely took her eyes off the numerous birds-turned-teachers. It was an emotional encounter; not only because these beautiful birds returned home but also because so many people showed up to say they cared. About the birds, the environment and our natural community.Carpenter Nature Center lefts its mark with me, as I’m sure it does all of its visitors. My daughters experienced nature that day. Not just saw it but felt it, smelled it and heard it. No screens, no squabbling over which shoes to wear, no “what can I do now?” The transformational energy that only a natural space can bring to bear surrounded them. Weeks later, they still talk about their adventure. Their world is small but their minds are great and, with open hearts, they discovered something special simply by being there. It opened a window to a new world — not a bad way to “kill some time” on a Saturday.